This pair of 1966-45 armchairs are part of the collection that Richard Schultz designed in 1966 at the request of Florence Knoll, who wanted well-designed outdoor furnishings that would withstand the corrosive salt air at her home in Florida. 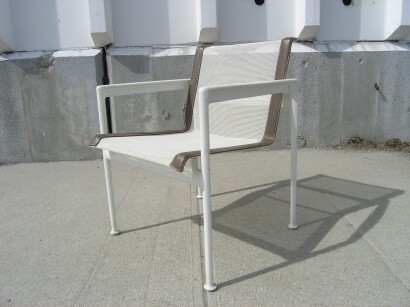 Through the years, the 1966 Collection has earned a special place in the world of outdoor furniture. 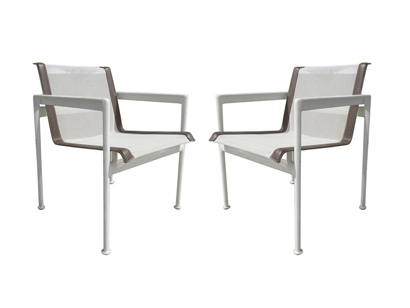 The chairs have white powder-coated aluminium frames, white vinyl mesh seating with brown trim. 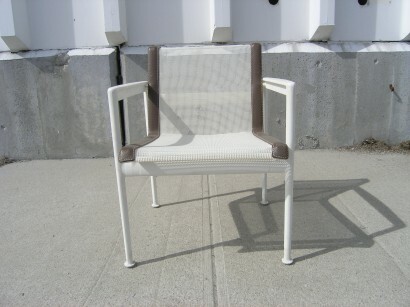 A corresponding pair of side chairs are also available.